Montpelier  is a city in the U.S. state of Vermont that serves as the state capital and the shire town (county seat) of Washington County. As the capital of Vermont, Montpelier is the site of the Vermont State House, seat of the legislative branch of Vermont government. The population was 7,855 at the 2010 census. By population, it is the smallest state capital in the United States. The Vermont College of Fine Arts, and New England Culinary Institute are located in Montpelier. The first permanent settlement began in May 1787, when Colonel Jacob Davis and General Parley Davis arrived from Charlton, Massachusetts. General Davis surveyed the land, while Colonel Davis cleared forest and erected a large log house on the west side of the North Branch of the Winooski River. His family moved in the following winter. It was Colonel Davis who selected the name Montpelier after the French city Montpellier. There was a general enthusiasm for things French as a result of the country's aid during the American Revolution. The settlement grew quickly, and by 1791 the population reached 117. In 1825, the Marquis de Lafayette visited Montpelier on a triumphal tour of America, 50 years after the Revolutionary War. The town developed into a center for manufacturing, especially after the Vermont Central Railroad opened in Montpelier on June 20, 1849—the same year East Montpelier was set off as a separate town. Falls on the Winooski River provided water power for mills. There was an iron foundry. Today, government, higher education, insurance and tourism are principal businesses. The Vermont History Museum, operated in The Pavilion by the Vermont Historical Society, is an attraction. The town had the first municipal water driven hydro system in Vermont in 1884. Water pressure generated sufficient electricity for streetlights. The state proclaimed October 12, 1899, as "Dewey Day" to honor native son Battle of Manila Bay and the Spanish-American War. Thousands turned out from the state to his hometown of Montpelier for the celebration. Montpelier is located at (44.2500, −72.5667) in the north-central area of Vermont. The city center is a flat clay zone (elevation ~520 ft/158 m), surrounded by hills and granite ledges. Towne Hill runs in a 2-mile (3.2 km) ridge (~900 ft/275 m) along the northern edge of the city. 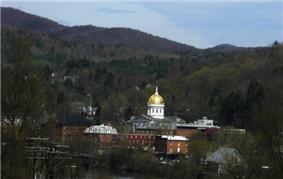 Montpelier is situated among foothills just to the east of the Green Mountains. According to the United States Census Bureau, the city has a total area of 10.3 square miles (27 km2), of which 10.2 square miles (26 km2) is land and 0.10% is water. The Winooski River flows west along the south edge of downtown village and is fed by several smaller tributaries that cut through residential districts. 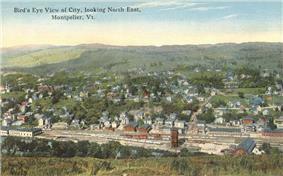 Montpelier is subject to periodic flooding in the flat city center, with two major floods occurring in 1927 and 1992. On its borders are the towns of Middlesex to the west, Berlin to the south, and East Montpelier to the north and east. Montpelier lies near the geographic center of the state. Montpelier features a humid continental climate (Köppen Dfb), with long, cold, and snowy winters, short springs and autumns, and warm summers. From January to July, daily means range from 16.4 to 67.3 °F (−8.7 to 19.6 °C). In winter, lows fall below 0 °F (−18 °C) on 24 nights and daytime highs stay below freezing for the majority of days from December to February. Snow is also frequent and remains on the ground for long stretches throughout the winter, though thaws are by no means infrequent. Average annual snowfall is 94.2 inches (2,390 mm). Summers are warm and often humid, with 2 or 3 days above 90 °F (32 °C), but rarely reaching 95 °F (35 °C). Extremes have ranged from −34 °F (−37 °C) in January 1981 to 97 °F (36 °C), most recently recorded in July 1977. Along with Barre, the city forms a small micropolitan area in the center of the state; together they are known as the twin cities. As of the census of 2010, there were 7,855 people, 3,739 households, and 1,940 families residing in the city. The population density was 784.0 people per square mile (302.7/km²). There were 3,899 housing units at an average density of 380.4 per square mile (146.9/km²). The racial makeup of the city was 96.55% White, 0.65% African American, 0.24% Native American, 0.82% Asian, 0.01% Pacific Islander, 0.39% from other races, and 1.34% from two or more races. Hispanic or Latino of any race were 1.41% of the population. There were 3,739 households out of which 26.0% had children under the age of 18 years living with them, 38.5% were married couples living together, 10.1% had a female householder with no husband present, and 48.1% were non-families. 39.4% of all households were made up of individuals and 13.1% have someone living alone who is 65 years of age or older. The average household size was 2.09 and the average family size was 2.84. In the city the population was spread out with 21.3% under the age of 18, 8.6% from 18 to 24, 28.2% from 25 to 44, 27.1% from 45 to 64, and 14.9% who were 65 years of age or older. The median age was 40 years. For every 100 females there were 84.2 males. For every 100 females age 18 and over, there were 82.0 males. Montpelier's government follows the council/manager plan. The city council consists of a mayor and six members each elected from districts with each district electing two members for two year terms. The mayor is elected in a citywide vote to a two year term. The council appoints the city manager who is the chief administrative officer of the city. The City provides municipal services for its residents and businesses. These include local law enforcement, firefighting, planning and zoning regulation, and provision for potable drinking water and wastewater. The median income for a household in the city was $37,513, and the median income for a family was $51,818. Males had a median income of $35,957 versus $29,442 for females. The per capita income for the city was $22,599. About 7.2% of families and 9.8% of the population were below the poverty line, including 12.9% of those under age 18 and 5.7% of those age 65 or over. 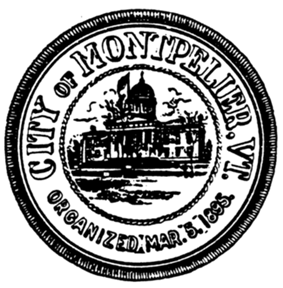 Since the city's establishment as capital in 1805 the primary business in Montpelier has been government, and by the mid-19th century government and life and fire insurance. Companies based in Montpelier include the National Life Group. Located in Montpelier are the New England Culinary Institute, the annual Green Mountain Film Festival and the headquarters of several insurance companies. 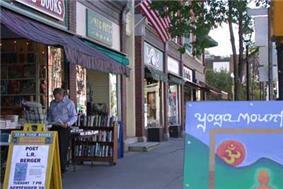 The majority of businesses in the downtown area, mostly retail, are locally owned. River Rock School is a private school serving kindergarten through 8th grade students. New England Culinary Institute, a for-profit career college named one of the top three culinary schools in the nation. Because Vermont's founders deliberately placed the capital near the geographic center of the state, Montpelier has become one of Vermont's most readily accessible cities and towns. The city is located along Interstate 89. East-west U.S. Route 2 and north-south Vermont Route 12 are two other principal routes that intersect in Montpelier. Both I-89 and U.S. 2 provide a direct link to Burlington and the populous Lake Champlain Valley in the northwestern corner of the state. U.S. Route 302 has its western terminus in Montpelier, connecting it with the nearby city of Barre and points east. Amtrak, the national rail passenger system, provides daily service from Montpelier Junction in nearby (Berlin), operating the Vermonter between St. Albans, Vermont and Washington, D.C.
Greyhound Bus Lines operates buses that serve Montpelier. The Green Mountain Transit Authority (GMTA) operates a local bus network throughout the micropolitan area, with stops in Montpelier and Barre, including nearby Waterbury, the Vermont State House, Ben & Jerry's factory, and the local Berlin Mall. GMTA and its sister bus company in Burlington, the Chittenden Country Transit Authority, operate a series of LINK commuter buses with stops in Montpelier, Burlington and Waterbury. A few small taxi companies serve the area. Air travelers in private planes can use the Edward F. Knapp State Airport in Berlin to access Montpelier. The closest commercial air service is located 35 miles (56 km) northwest of Montpelier, at the Burlington International Airport. Two shared-use paths for walking and bicycling connect to Montpelier: the Cross Vermont Trail and the Central Vermont Regional Path. Montpelier's downtown is relatively compact and pedestrian-friendly, with sidewalks and crosswalks throughout the downtown area. The Vermont Mountaineers of the New England Collegiate Baseball League play at the Montpelier Recreation Field. An annual local vernacular culture phenomenon, the Valentine Phantom, a tradition of covering downtown storefronts and public buildings with red hearts each February 14, began in Montpelier in the 1990s. The city has three city parks and one non-profit nature center. Hubbard Park rises behind the state capitol building and extends along the ridge line towards the North past the pool to the stump dump. 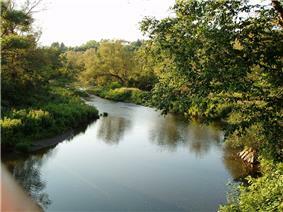 Accessible from Cummings Street off State Route 12, the North Branch River Park is the second largest park in the city. The Mill Pond Park is located along State Route 12 approximately a 0.25 miles (0.40 km) from the cemetery and features boat access to the North Branch river, as well as benches and short-term parking. The North Branch Nature Center is located at the northern end of town and includes 17 acres (6.9 ha) of protected land as well as a community nature center. A bridge from the North Branch Nature Center connects the land to the North Branch River Park on the opposite side of the North Branch River. Also Mt. 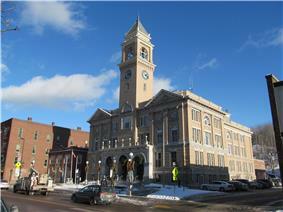 Mansfield is 4,393 ft.
^ Title 24, Part I, Chapter 1, §13, Vermont Statutes. Accessed 2007-11-01. ^ Smallest capital city plans big MLK celebration. Retrieved 2010-04-23. ^ Swift, Esther Munroe (1977). Vermont Place Names: Footprints of History. Houghton Mifflin. pp. 451–454. ^ "Montpelier: Economy-Major Industries". City.com. Retrieved 1 April 2011. ^ Barg, Lori (9 August 2009). "Power from the plumbing". Burlington, Vermont: Burlington Free Press. pp. 5D. ^ "George Dewey (1837–1917) Family Papers, 1844–1901 MS 125". Retrieved April 14, 2013. ^ "NOWData – NOAA Online Weather Data". ^ "Capital City Concerts – Montpelier Vermont's Premiere Classical Concert Series". Retrieved April 14, 2013. Coolidge, A. J. & Mansfield, J. B. (1859). A History and Description of New England. Boston, Massachusetts.